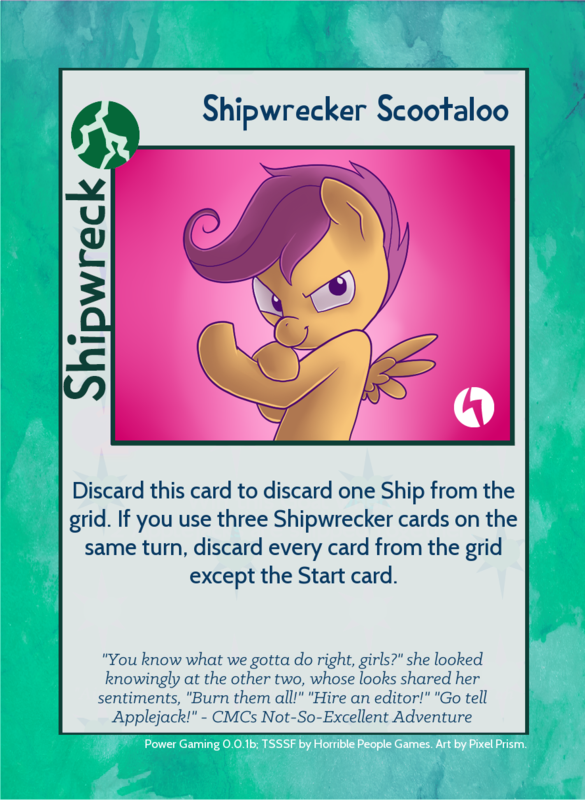 So I got in contact with Horrible People and, long story short, they gave me the go-ahead to complete and share the unfinished Shipwrecker cards from the Power Gaming expansion. So, a bit of fiddling in GIMP later, and here they are. Major thanks to Ithry not just for the flavor text (which he created himself), but for helping with rules wording. Equally big thanks to Western, who provided files like the blank Shipwrecker front for these cards. Incidentally I have the layered projects saved, so I can make edits to these incredibly easy if need be. Translate TSSSF game, nothing special. 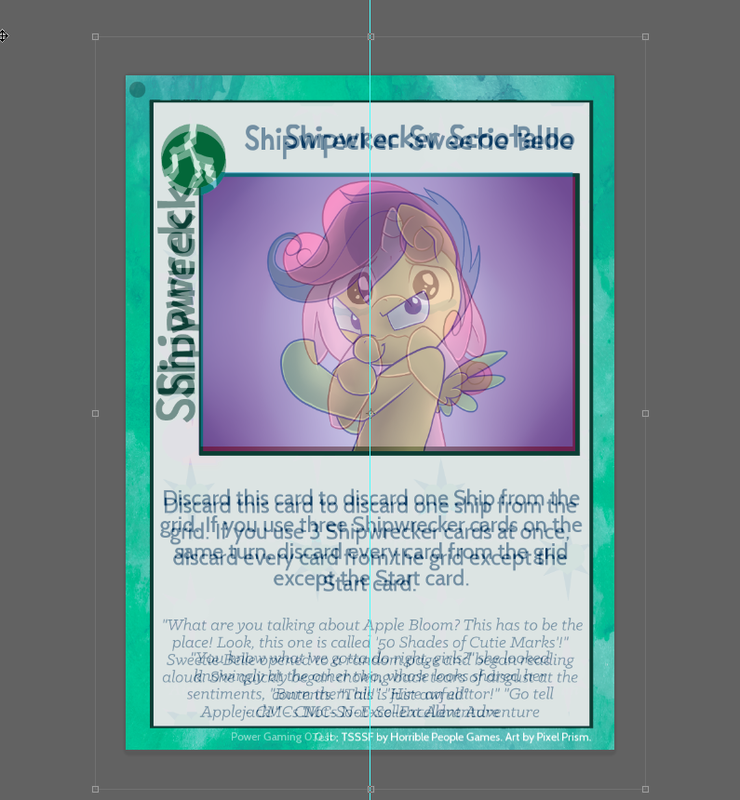 I think part of that is the unfinished design of the Shipwrecker card front. I actually placed the images to exactly overlap the placeholder image that Horrible People used, and that's why they all have small dark borders around them. The problem is, the design doesn't match up with the rest of the game, where there's normally space for keywords. It kind of throws the whole thing out of alignment. I can take a look at it when I get back to my computer this evening, though — I may still just have it out of its proper place. And I forgot to thank you in the OP. Your files, like the blank Shipwrecker front, were incredibly useful. I'm going to edit that in. So, I compared it to a goal card, and... well, everything's just a bit off. 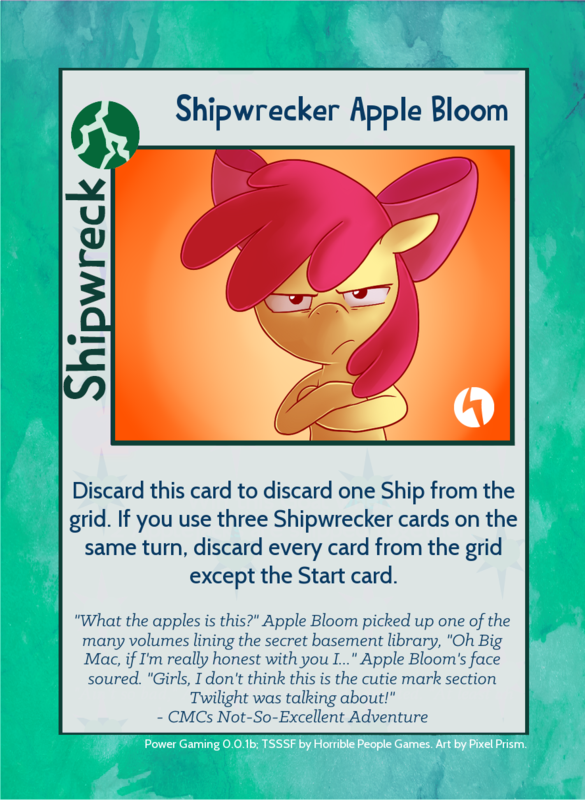 I don't think I have the power to fully correct it, really, because part of the problem is the "Shipwrecker" on the side is so far up that moving the shipwrecker symbol down where it should be would overlap the letters. The image seems to be slightly the wrong dimensions, too. 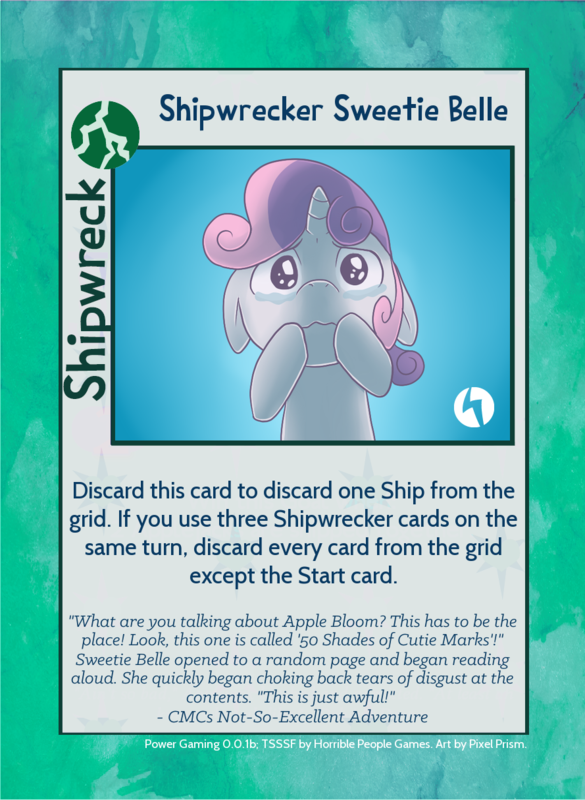 I centered up the image on the background for Sweetie Belle. Does this look any better? I think it looks much better, the image centering that is. Hmm, maybe change position for "Shipwreck" ? I honestly have no idea how I would. 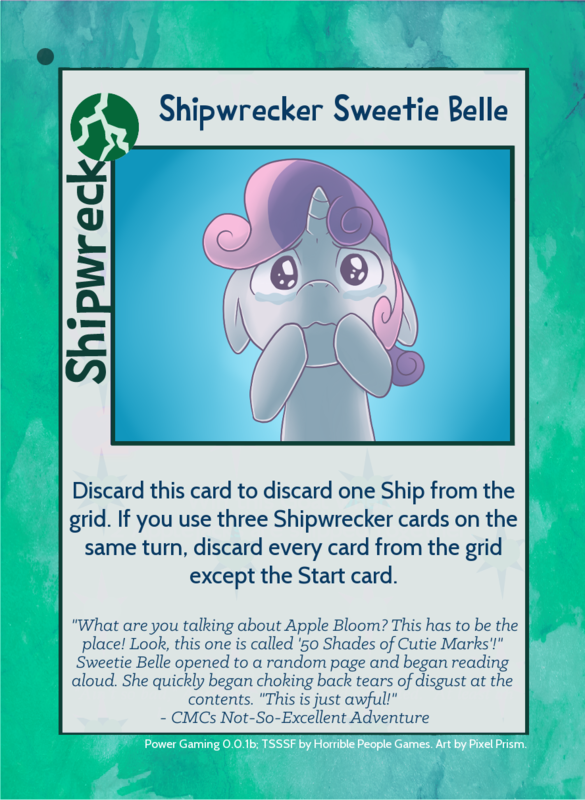 My photoshop skills are minor, and by the looks of things the Shipwrecker template you made that I used here was done by running a different template through a color filter, since it's a slightly different color than the original, unfinished Shipwrecker cards. I refresh today Shipwrecker frame, and resend you. Thanks a lot for that, Western. I layered your image over the bleed files (so I can print them out), but I kept a few things from my original card. The rules text I want to keep spelled "three" instead of "3" because of Fanfic Author Discord, the name I felt was more lined up the way I had it, and I wanted to use "Power Gaming 0.01b" instead of "0.01a" just because of the small changes between the unfinished ones Horrible People had and the ones I made here. But again, super-big thanks for all the work you put into that. I edited the opening post to show the "new" complete versions. Im in, but why cant we draft the movies like we do with the full year box office? Just wondering?